Charles Colcock Jones, 1831-1893 The Siege of Savannah in December, 1864, and the Confederate Operations in Georgia and the Third Military District of South Carolina During General Sherman's March from Atlanta to the Sea. The Siege of Savannah in December, 1864, and the Confederate Operations in Georgia and the Third Military District of South Carolina During General Sherman's March from Atlanta to the Sea. Albany, N.Y.: J. Munsell, 1874, c1875. 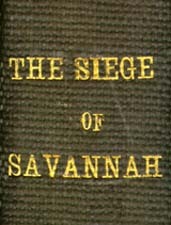 Savannah (Ga.) -- History -- Siege, 1864 -- Personal narratives. Sherman's March to the Sea -- Personal narratives.